The exquisite range of leather jewelery case offered by us is designed at par with the latest market trends. These are provided with 3 zippered compartments designed for keeping bangles, ear rings, necklace and for the rings separately. Further, it also has a large pouch. The closing mechanism keeps all the valuables secure. It is stylish and attractive to carry in a comfortable manner. These Cases are CEMILAC approved, highly reliable, rigid weather proof and customized enclosures, manufactured “to suit customers demand. Vega aviation supplies these cases to defence. DRDO, Aviation industry ISRO, BEL, BEML to name a few. Papier Mache Hand Painted Jewelry Box with Key Lock. Available in other different Designs & Sizes. 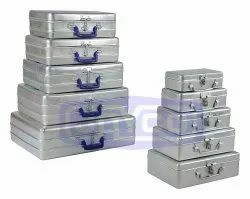 We are known in the industry for presenting world class Oxidized Silver Jewelry Box to our customers. Our Oxidized Silver Jewelry Box is highly reliable and effective to keep the jewelry safe for long time. Also, our jewelry box is available for our customers in various beautiful designs and standards sizes. Rajasthani Handicrafted wooden Jewelry Box with marble plate on top with real gold and meenakari work. We are engaged in the manufacturing, trading and exporting of Imitation Jewellery Boxes that are best in quality. We leave no stone unturned in attaining the satisfaction of the clients and deliver them with better than the best. We are supplier, distributor, manufacturer, exporter and wholesaler of Jewelry Paper Box. These are excellent quality durable paper box used for storing jewelry.